Palestinian Prisoners Day was last week marked with actions in 11 countries protesting the complicity of British-Danish security company G4S in Israel’s prison system. The company provides equipment and services to prisons at which Palestinian political prisoners, including child prisoners, are illegally detained and subjected to torture. 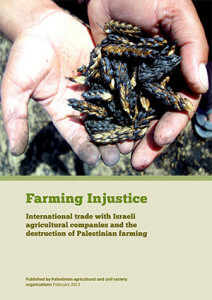 We, Palestinian organisations and unions representing farmers struggling for their right to their land and to food sovereignty, urge international civil society organisations to build effective campaigns and work towards ending agricultural trade with Israel that finances and rewards the destruction of Palestinian farming. For Palestinians, farming is tied to Palestinian identity, history and resistance to Israel’s illegal occupation. Palestinian farmers face the brunt of Israel’s land confiscations, demolitions and theft of water. Today, on Palestinian Prisoners’ Day, we the undersigned Palestinian civil society and human rights organisations salute all Palestinian political prisoners, especially those engaging in brave civil disobedience through ongoing hunger strikes in protest to the ongoing violations of human rights and international law.